We are so happy with the results our new LEMON GRASS PLANTS repelling WASPS we wanted to share the results with all of you. For those who didn’t hear the story, our homestead was developing a bit of a red wasp problem building nests in and around our animal buildings, house, and our son’s mini-play-cabin. However, this spring we planted 7 young lemon grass plants, where the nests were most problematic, due to the plants natural wasp repellent properties. WE ARE EXTREMELY HAPPY TO SAY WE HAVEN’T HAD 1 WASP THIS YEAR ON THE HOMESTEAD!!!. LOOKS LIKE LEMON GRASS WAS AN ALL NATURAL RESPONSE THAT WORKED BETTER THAN ANY CHEMICAL SPRAY WE HAVE EVER TRIED IN THE PAST. GREAT JOB MOTHER NATURE!!! We recently added 7 more BERRY TEE-PEE’S to our fruit garden. Their construction allow for EASY containment of vine or fast spreading fruit plants like black berries and boysenberries. With their 4×4′ base, they are easy to walk around and help to minimize fruit loss in the middle of the bush that you might otherwise be unable to reach. We now have 2 boysenberry, 2 blackberry, 2 golden raspberry, and 2 currant plants. To construct them we made a 4′ x 4′ raised garden bed out of 2×4’s. Next we ripped (2) 7 foot 2×4’s to make (4) 2×2’s on the table saw. We then screwed the 2×2’s together at the top of the tee-pee and secured the bottom feet to the 4′ box using 2 1/2″ screws. By using the height of our drill as a guide (about 10″) we drilled a series of holes in the vertical legs to feed our 20 gauge wire through to make a total of 7 horizontal rungs. This will give your vine fruit something to climb. We’re really happy with how this entire project has turned out and we are looking forward to expanding our grapes within our FRUIT GARDEN next. Last year we grew quite a bit of various tomatoes plants. Instead of spending a lot of money on a countless number of metal cages, we cut up some scrap lumber we were hanging on to for a project just like this. By driving the the stakes ( 33 – 36″) into the ground around the tomatoes and running a string line around each of the stakes several times we had a great set up for the tomato plants to climb. Last fall we were able to reclaim the stakes as well as the string to do it again another year. It turned out great while saving us money, and we always love that. As homesteaders we tend to put up with certain things, like how mud and chicken coops typically go hand in hand. Growing tired of walking and slipping in the mud every morning during the rainy season, it was time to do something. We had recently replaced our back deck. Instead of just throwing the old deck away, we decided to flip some of the boards over and give the lumber a new lease on life, as a CHICKEN COOP BOARDWALK. Finally, the coop needed a fresh coat of paint to brighten up the space, as well as some new welded wire after an animal attack tore apart one wall. We will be the first to admit that it might not be our “dream coop,” but in the end we are truly happy with how it turned out. Most important though was NO MORE MUD and the project cost us NEARLY NOTHING due to the fact that almost all of the material was reclaimed!!! 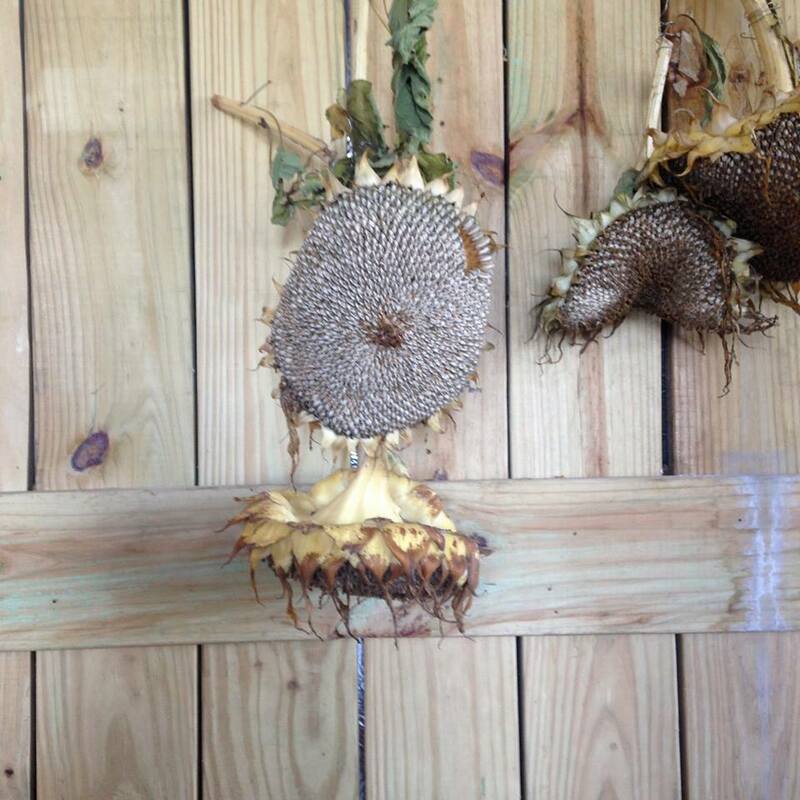 Have you harvested your sunflowers yet? It is easy and the kids will love helping with this one. Hang to dry for about two weeks. 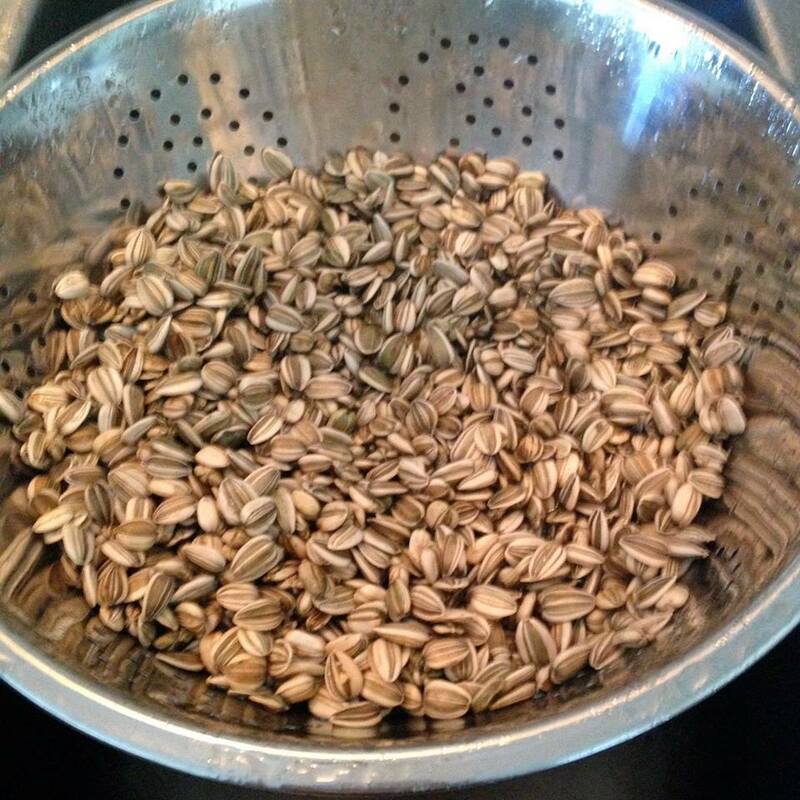 Rub your thumb over the seeds and they will just fall out. 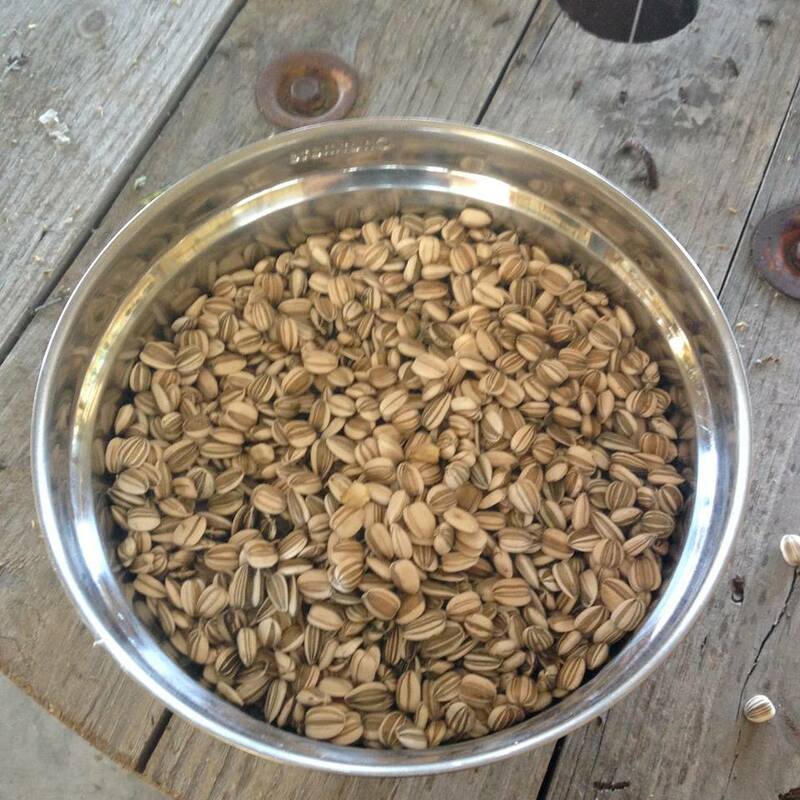 I got eight cups of seeds from four plants. 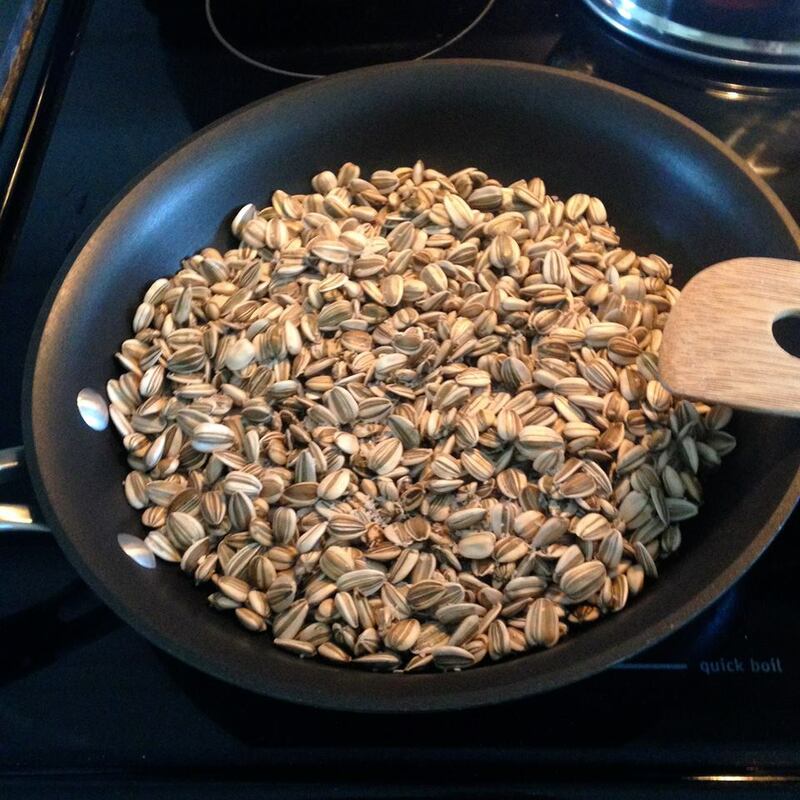 Rinse thoroughly, I pick out the plump ones and roast them in a frying pan on medium with Kosher salt until they give you a popping sound. 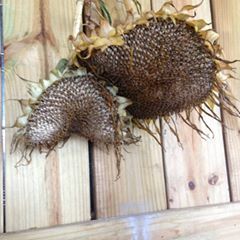 Don’t forget to save some for your next year sunflowers and the birds for the winter. 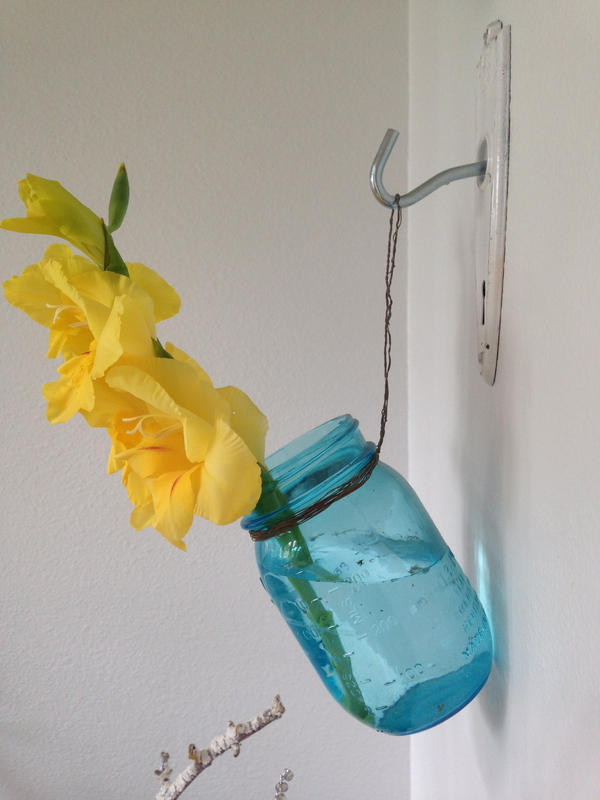 HANGING MASON JAR VASES WITH GLADIOLUS! These are very easy to make with a wire or rope. 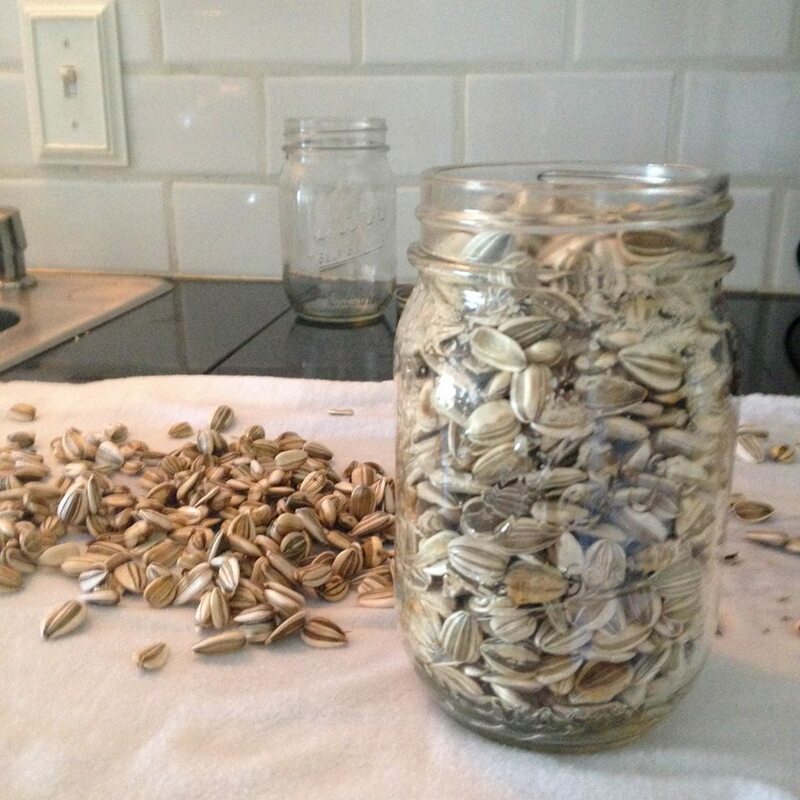 Place around the lip of the jar and leave enough to hang. Add a favorite hook to the wall. 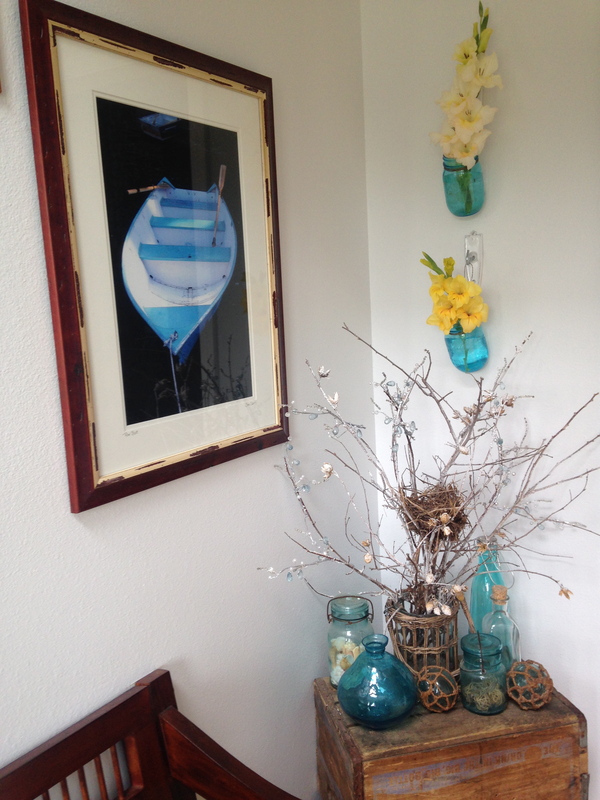 I love being able to hang fresh flowers in the Entryway. 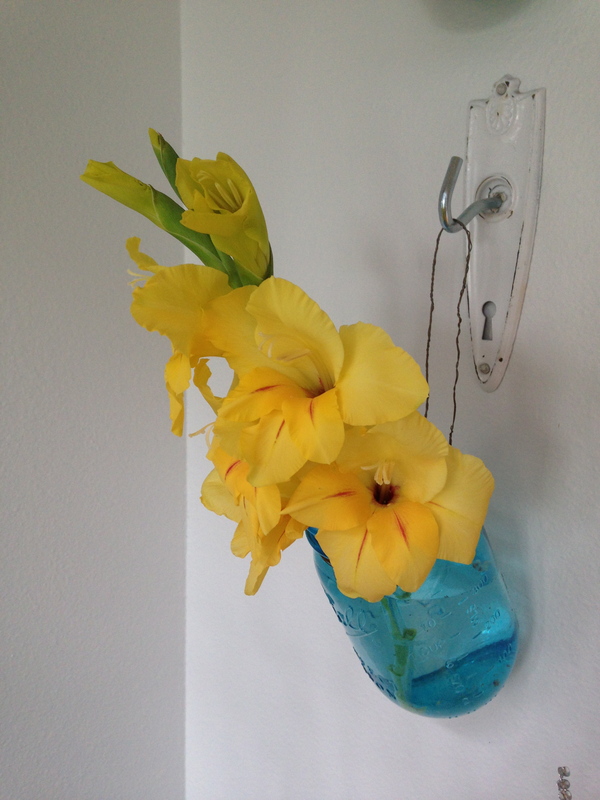 GLADIOLUS are easy to grow. It’s sometimes called the “Sword Lily” It is hardy to Zones 5-8 and the bulb can be left in the ground year round in an area with sufficiently dry winters. The leaves must be allowed to die down naturally for wonderful blooms next season. 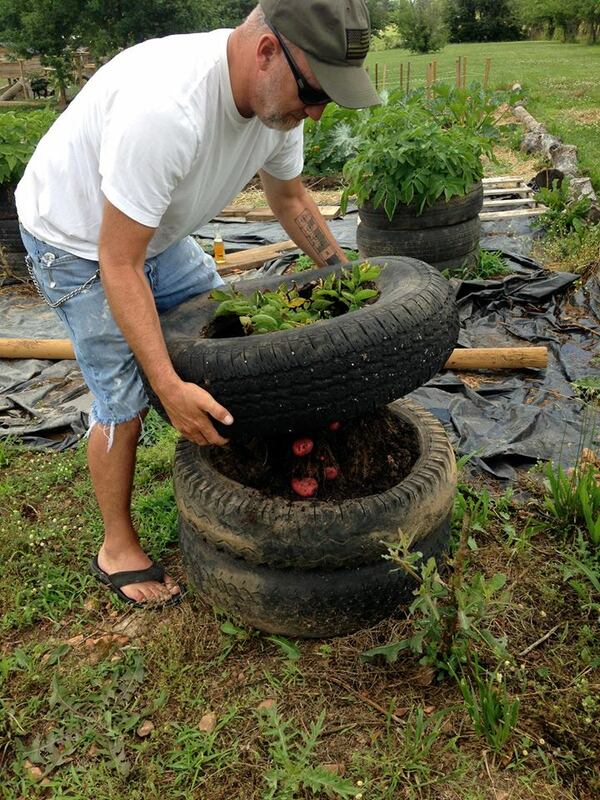 These potato towers made outta tires worked out pretty good. It wasn’t our first choice for making potato towers but, when the tires were free and you’re crunched for time… we just had to give it a try. 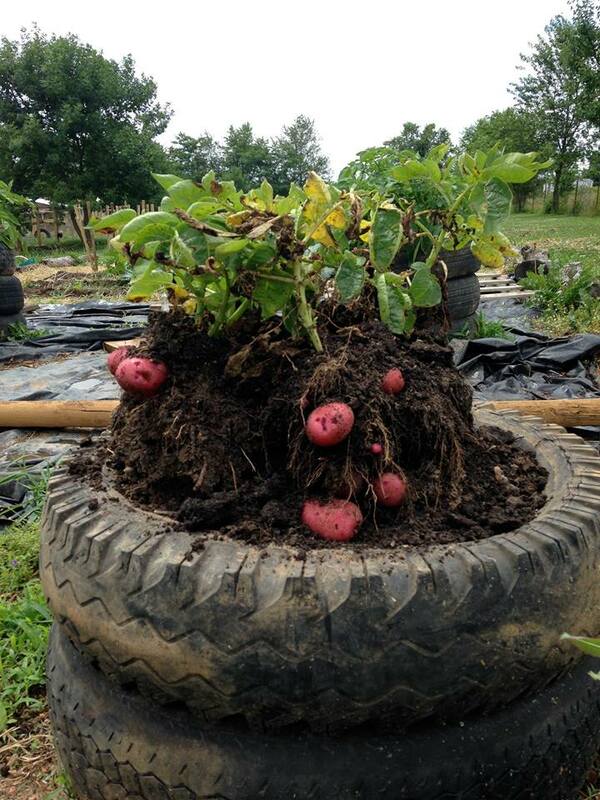 We pulled only 1 tire off 1 tower to check on them because we have never grown potatoes this way. We got about 20 really nice spuds and saw that there were many more tiny potatoes still left on the plants. 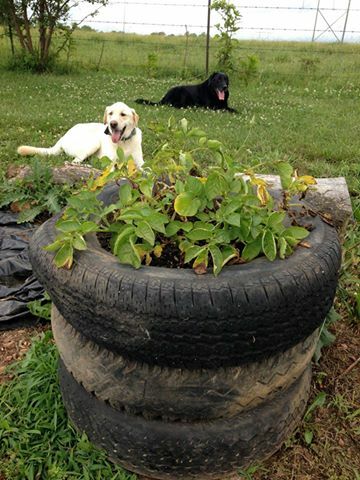 So we replanted them back into the tower, which is now only 2 tires high to see if we can get some more red potatoes out of these plants.